Two days ago I wrote an article in the Newsday focusing on how Youtube is changing and shaping showbiz and entertainment in Zimbabwe. The riveting yet revealing piece touched on the silent but raging storm and battles amongst artists, managers, content creators, and Youtube bloggers. 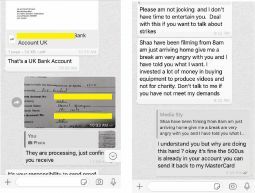 I made reference to an ensuing tiff between a leading media company Sly Media Tv and the biggest and most followed Youtube channel in Zimbabwe by Stewart Nyamayaro. Sly Media Tv is Zimbabwean online TV Channel that specializes and facilitates Online Streaming to all Social Media Platforms and provides a one-stop shop for various content producers that target the consumers from the Zimbabwean community who use smartphones, computers, and Tablets, to keep in touch with one another. The battle that has been unfolding under the carpet saw the channel with the highest number of Zimbabwean music videos, songs, and other videos on current affairs being shut. A development that should awaken the entire creative sector on the aspects of copyright and digital creative industry. This is a topic that often opens up on in so many conversations and some skirt around the issue without putting many contexts to it. Most Zimbabwean artists are not informed of the importance of copyrights and also the need to acquaint themselves with knowledge. Well, the internet is the stock exchange for music, this is where artists get value and build on numbers, numbers that translate to figures in their bank accounts. A simple laymen understanding of the numbers game is career changing. A monetized Youtube account for a good artist will pay more royalties than the entire 18 Radio Stations we have in Zimbabwe. Bustop TV last year celebrated their achievement after buying a mini-bus from Youtube earnings. Zimbabwe Music Rights Association (ZIMURA) has been struggling for years to collect revenue on behalf of artists from distributors, venues, DJs and Radio stations so as to remit it to the content creators. The non-transparency manner, inconsistencies and suspicions clouding this issue have seen a number of artists opting for the democratic space, the internet, where they can manage, control, monetize their content and get valid analytics. Sadly, with the introduction of bond notes and later RTGS dollars replacing the previously dominant USD accounts has seen a lot of content creators falling at the mercy of diaspora-based content distributors. The diaspora community has the ease of doing business online given the unlimited access to the internet, accessibility to online transactions using Paypal, Visa or MasterCard which is not easy for many people in Zimbabwe. Over the years the diaspora community has become the main base for Zimbabwean content archiving as technology hits them first before it reaches Zimbabwe thereby making them a key stakeholder in the creative sector. Most of your favorite and popular Zimdancehall artists with tons of material on Youtube do not own a channel and have no idea how it got there and even if someone makes money with it or not. They don’t care until someone alerts them. Remember Youtube gave most artists their breakthrough and radio always joins the party late. 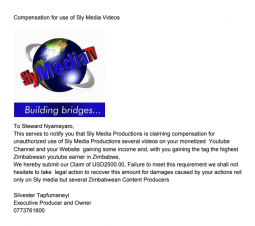 Sly Media discovered that Stewart’ monetized Youtube channel was carrying several of their videos and they made a copyright report to Youtube. 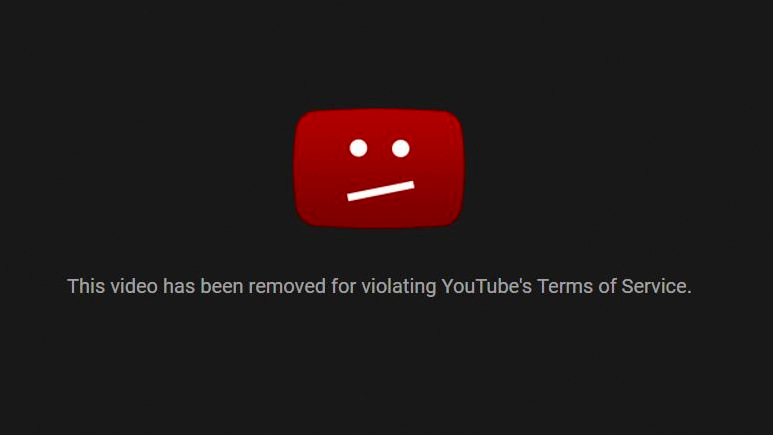 Initially, it is believed that Stewart and team paid a deaf ear to the copyright strike despite it posing a real threat to the entire channel carrying thousands of videos. We put so much money, work and effort to create content and some find it easy to steal that content and share as their own, making money off our work. We did nothing wrong, we simply followed Youtube terms and conditions and reported a copyright infringement. They should deal with Youtube now. We tried to amicably engage them but instead, that was met with threats and arrogance. He added that artists, managers, and content creators must at least notify him first to take down their material if they don’t understand some of the agreements he has with Jacaranda Media Group. The Artists on our roster benefit from Radio airplay to regional and International charts plugins, Music Video Channel submissions to marketing consultancy, distribution, licensing, CD production, wardrobe, lifestyle upkeep to being financially stable. We have Artists who are signed to Jacaranda who have benefitted greatly financially to the point that they now take care of their family’s and do charity and philanthropy work through the benefit they receive working with us. Some Artists are on monthly salaries, some have built houses, and now live a very comfortable life. We have a very bittersweet but healthy relationship with YouTube Channels, bloggers, social media influencers press reporters and event promoters. We acknowledge the power and influence the above mentioned have and we always take every opportunity to work with them in building an Artist brand and reach. When we deal with music video directors, YouTube Channels who do not respect the contract and sometimes we deal with issues whereby content distributors have uploaded the artists’ song or project on YouTube starting monetizing the content without consent from Jacaranda Media Group or the Artist and we now have to file copyright injunctions on them. I spoke to Tannia Ngwenya, Head of Kosha Management an affiliate with UK-based Jungle Entertainment Ventures, a global music management company who are managing most of the popular artists from Zimbabwe and the entire Chillspot catalog. They have artists such as Takura, Killer T, Stunner, Seh Calaz and many more. She said their company offers an initial standard70/30 split content rights monetization (distribution) deal with artists, with 70% being apportioned to the artists. The artists maintain ownership of their copyrighted works, Jungle is just awarded a license to distribute digitally i.e: on iTunes, Spotify, Tidal, VEVO for videos, etc. They also offer an extended Rights Management deal, which sees us assist in the administration of their performance rights, ensuring that artists can receive publishing royalties when their work is broadcast on international radio, TV, club, and/or stage platforms, including too its synchronization or use/placement on visual content. Now the biggest question is what will happen to the hundreds of videos, songs that were carried on the Stewart Nyamayaro channel? How will it affect artists and producers? What lessons should the Zimbabwean creatives draw from this experience? Until next time, the plot thickens. The title and tone of the article makes it sound like the author is sympathetic with individual who was pirating content on YouTube. Piracy is piracy, regardless whether or not you are making money in the process. Anyway, if he wasn’t making money, or doing anything wrong, why did hey pay the $500. Let’s not condone the actions of those who take advantage of the less tech savvy assuming that they are too dumb to find out their content is being used. They must ask for permission, not say that the copyright owner should approach them to take down their content. You wouldn’t take a physical product of someones sweat and use it without permission, so why would should one be allowed to do the same with digital products.